Short Trachten Lederhosen Beppo3 in Bison Brown. 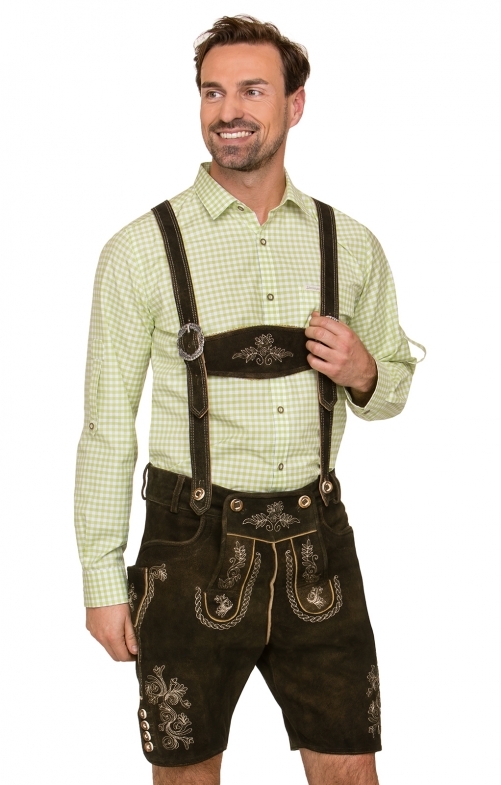 Our decorative tan-coloured H-Träger Beppo3 Havanna Lederhosen, from top brand Stockerpoint, are the perfect choice for traditional German occasions and beer festivals. Featuring an intricate golden design neatly embroidered on the h-beam suspenders, front panel and thighs, as well as buttons on the bottom of each leg and beige piping throughout, these Lederhosen are the epitome of style and sophistication. With two front pockets, a rear pocket and a knife pocket on the right thigh, this item is made from 100% leather for a comfortable Oktoberfest fit. Qualität und Preis passen absolut zusammen. Relativ schnelle Lieferzeit. Top Qualität und schnelle Lieferung!